Would you like to sell on Etsy? Visit my Etsy Marketing shop with the link below. 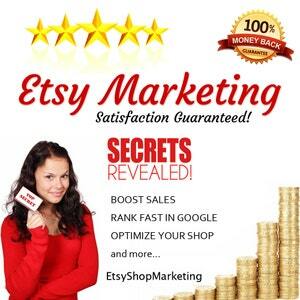 Etsy Shop Marketing – How to Optimize your Etsy shop for optimal success. SEO, Marketing and Optimization Guide. Every page contains something useful for me to apply to try to grow my Etsy business. The item was available immediately. Sandy is willing to answer questions and seems sincerely interested in helping others succeed My only regret is that I didn’t buy this BEFORE I set up my shop. This is a great resource! Even though I have been on Etsy for a few years there were tons of ideas I did not know about or haven’t tried yet. I already started doing some of the tips that are included right away and KNOW it will help grow my shop! Thanks for the great resource! I will definitely be coming back for more! This is Awesome! It is a very user friendly guide that has some great tips. Thanks so much! Very informative and helpful information. I have already tried some of the techniques to increase sales within my jewelry shop. Well written and useful guide – will have to take the time to work through it but believe it will certainly help me improve my listings. Thank you!